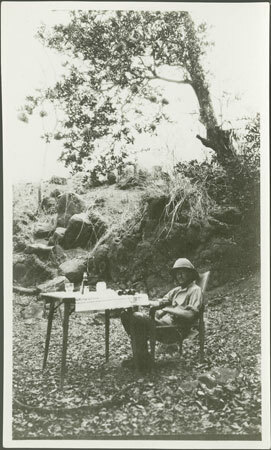 A portrait of Charles Meek (1885-1965) sitting at a camp table laid with drinks and binoculars, perhaps during a rest in marching. Meek was both an administrator and anthropologist who spent most of his career in Nigeria. Morton, Chris. "Meek at expedition camp table" Southern Sudan Project (in development). 03 Jan. 2006. Pitt Rivers Museum. <http://southernsudan.prm.ox.ac.uk/details/1998.204.5.69/>.